Delightful I’ve always eaten more than my husband, and I’m the cook. It hasn’t been a problem until the last few years. Now I have a mantra I chant as I’m preparing dinner, “Eat small, be small.” But I think the real culprit is that glass of wine while I’m cooking! Sounds like you and Ranae have figured out a way to manage creation and consumption. It is nice you like to cook John. Do you have a year round garden? Except through the hot season, Melanie. 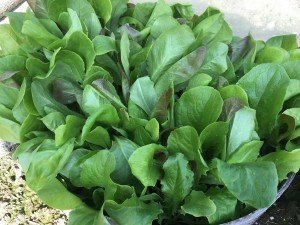 We pick the leaves off the lettuce as we need them and we can sometimes get our plants producing from January to May. We get a couple of crops of broccoli and radishes. The rest I buy. Tomatoes are cheaper at the farmers market than they are to grow. I never thought about differences in calorie intake between men and women and how that can affect their weight.. Thanks for the enlightening article! Yes, it can be a real problem; mine is similar. Little woman just loves to bake. I do survival cooking and salads. We both prepare far too much, because of the optical illusion that pans and serving dishes ar Lilliputian so must be filled. Solution that works for us: I eat fast and plenty while she eats slow and small, so we start and finish our meals at the same time. Leftover control is achieved first by using the the grandchildren as child labor, invite them over often; this prevents leftover generation on days they are here. Backup device is the dog; most dogs are four-legged famines by nature, ours has three legs and over-compensates. Very useful! Thanks Ian. Eat Fast – I love it! I’ve been mad at Mother Nature all my life. Why did she make me a “sturdy girl?” Then a few years ago I woke up and realized I needed to be ticked off at Mother Annis. I’m doing a better job of controlling my weight — and therefore my risk of diabetes and other health problems — but sometimes it’s a real struggle.